Mountain Art Quilters: February brought unexpected snow after a warm and sunny January, but somehow, we managed to squeeze a MAQ meeting in between snow storms. And what a great meeting! We had Show and Tell from new and old members alike, and a great presentation by Kathy Madison. February brought unexpected snow after a warm and sunny January, but somehow, we managed to squeeze a MAQ meeting in between snow storms. And what a great meeting! 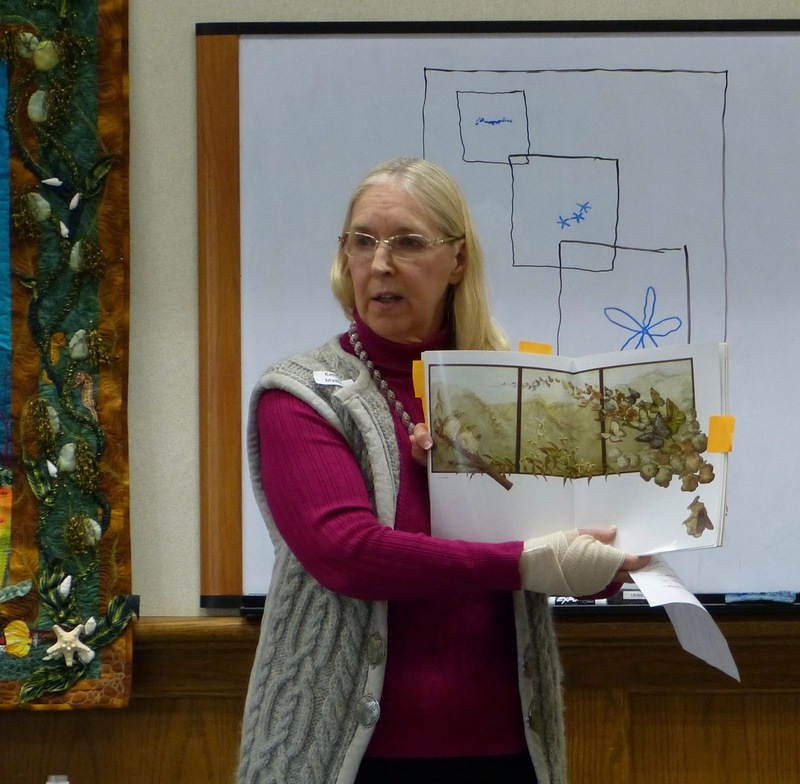 We had Show and Tell from new and old members alike, and a great presentation by Kathy Madison. 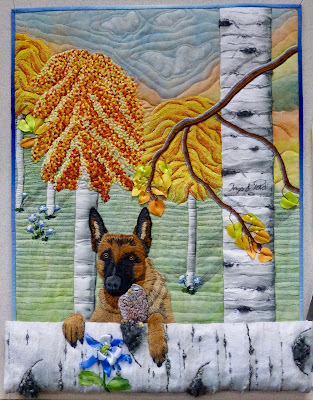 Michelle Peerson shared with us the quilt she made in response to Jane Haworth's photo challenge. 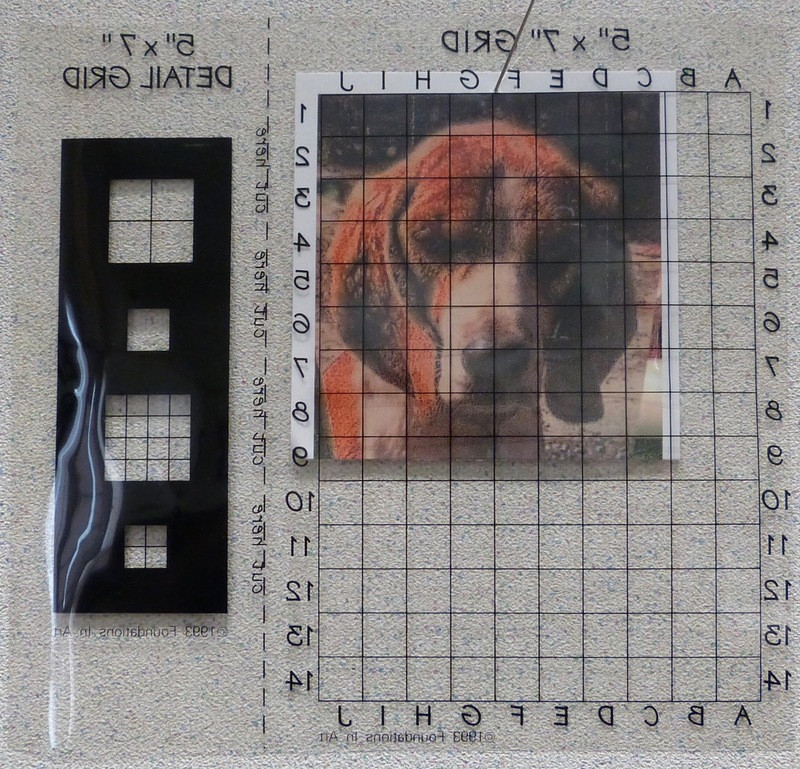 Four of our members ended up using this photo as inspiration for their 24"x24" quilts. 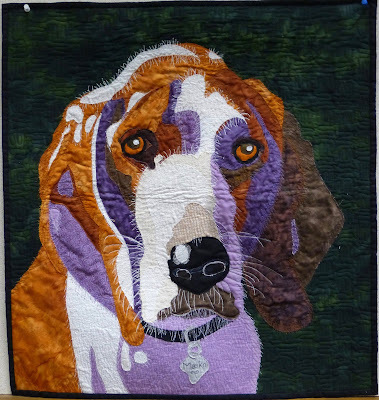 Michelle decided that this quilt called for piecing curves, something she had never done before, and she was surprised to find it not as challenging as she expected. Jan Reed shared this quilt-in-progress, "Spread Your Wings." 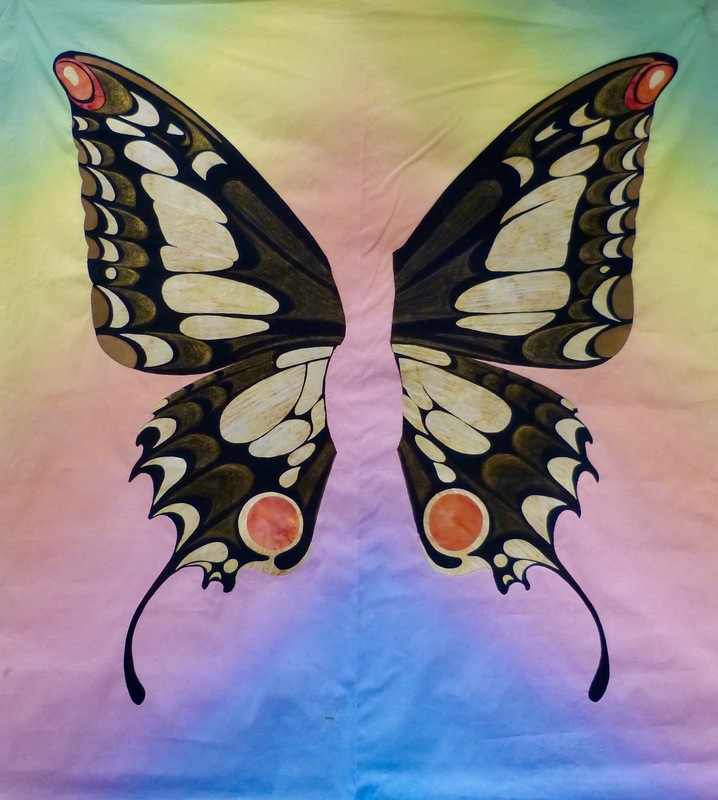 Jan created the background by using Photoshop Elements to create a gradient, which she then had printed on fabric at Grass Valley Blueprints. 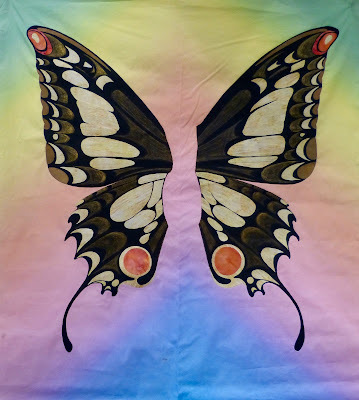 While working with black ink on the appliquéd butterfly wings, she accidentally got a small blotch on the background. Rather than despair, Jan decided to use this mistake as a design opportunity. 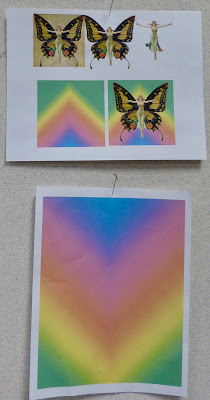 She now plans to add a curvy, black border and a mock mola technique to both enhance the design and disguise the blotch. 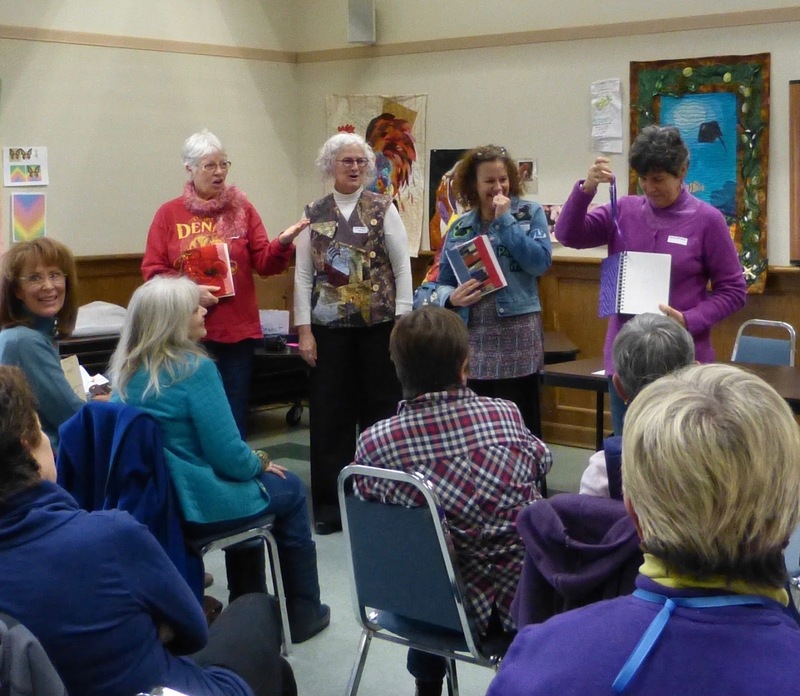 Bonnie Lattin-Hensely, Jane Haworth, and Karle deProsse (seen here with Trish Morris Plisse) showed off their completed journal covers. 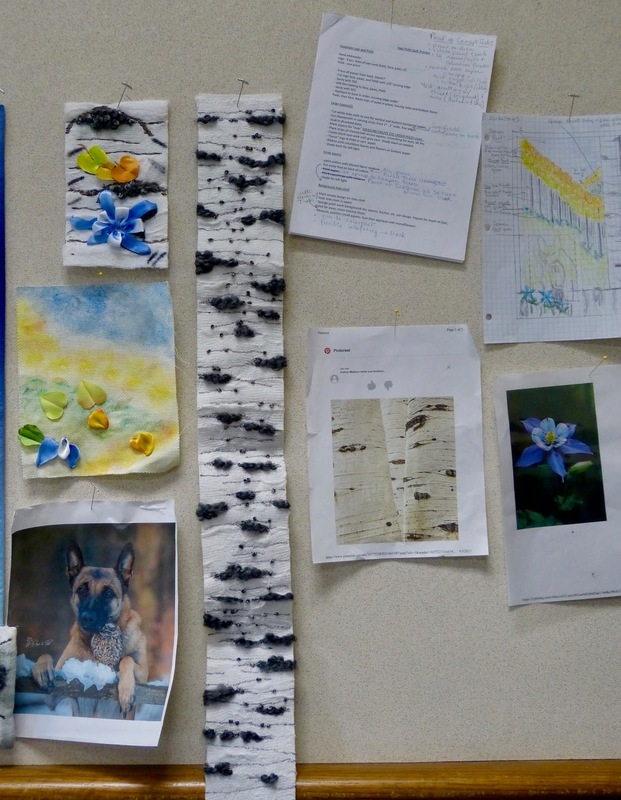 This is a group-wide project that will be explored in more depth come June. 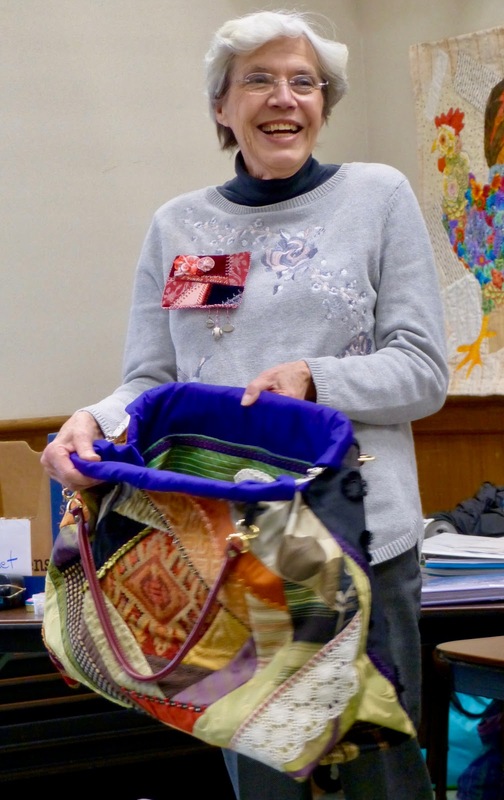 Lynda Lasich brought in this crazy quilt carpet bag that the Artitude mini-group will be using as a basket for its contribution to the Pine Tree Guild. Lynda and friends used Roxanne Langan's 1920's Carpet Bag Pattern. Trish used the same pattern but made her bag in denims. Nice! 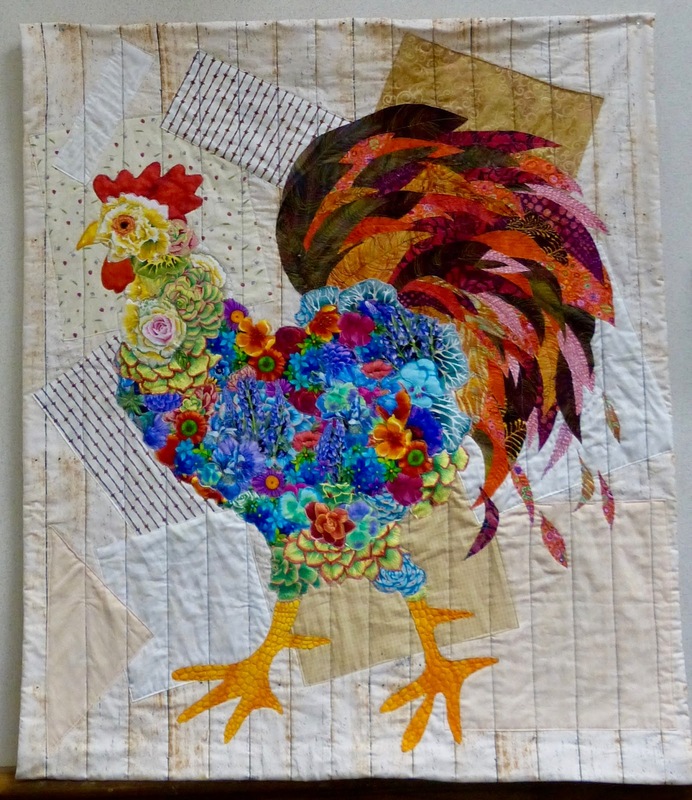 New member, Bonnie Lattin-Hensely shared several of her quilts including this colorful rooster. 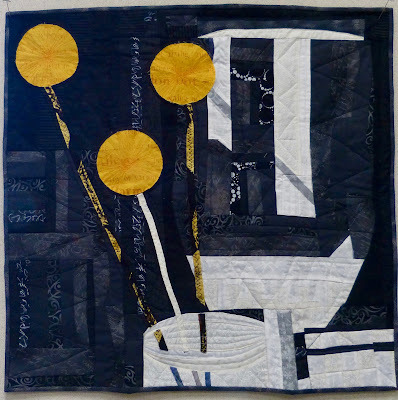 She bought an outline pattern online and then interpreted it with her own fabric choices in a raw edge appliqué. Bonnie used the grid method to create this portrait of Meeko. She decided to use purple for the shadows. This is a pillow Bonnie made for her sister. It features beading to enhance the design. 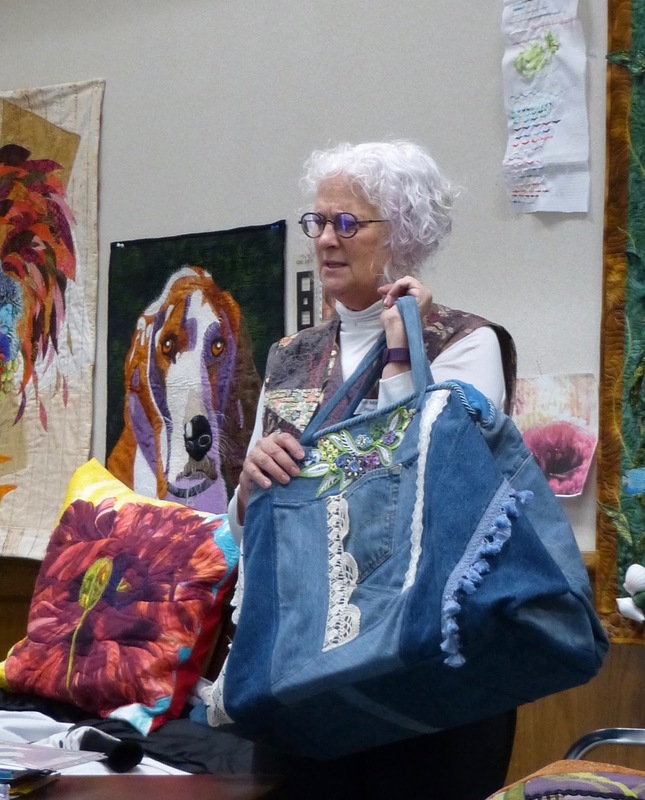 Kathy Madison shared the techniques and methods she uses when designing and creating her quilts. 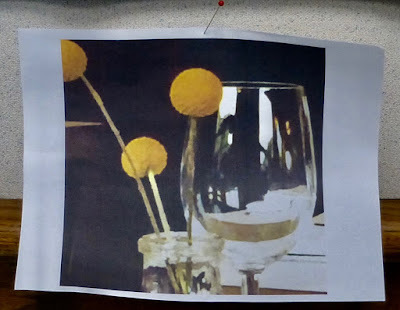 Kathy credits Annemieke Mein with being one of her inspirations. "Cayman Memories" is one of Kathy's earlier quilts. She notes that she was not satisfied with this quilt and realized she needed to learn more about quilt design. She feels that the quilt lacks a focal point and fails to tell a story. She also feels that she overdid the embellishments. 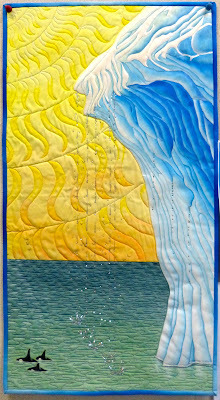 "Arctic Tears" is a quilt from our April 2017 reveal. 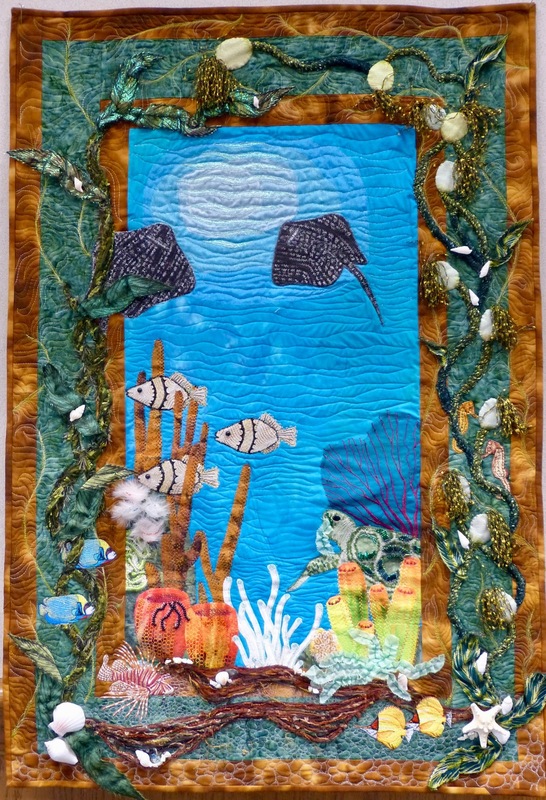 This quilt clearly tells the story of melting ice in the Arctic and creates tension between the melting ice, the vivid sun, and the whales in a changing climate. Considerations in designing "Arctic Tears" were a establishing a focal point, a vanishing point, a color palette, and a light source. 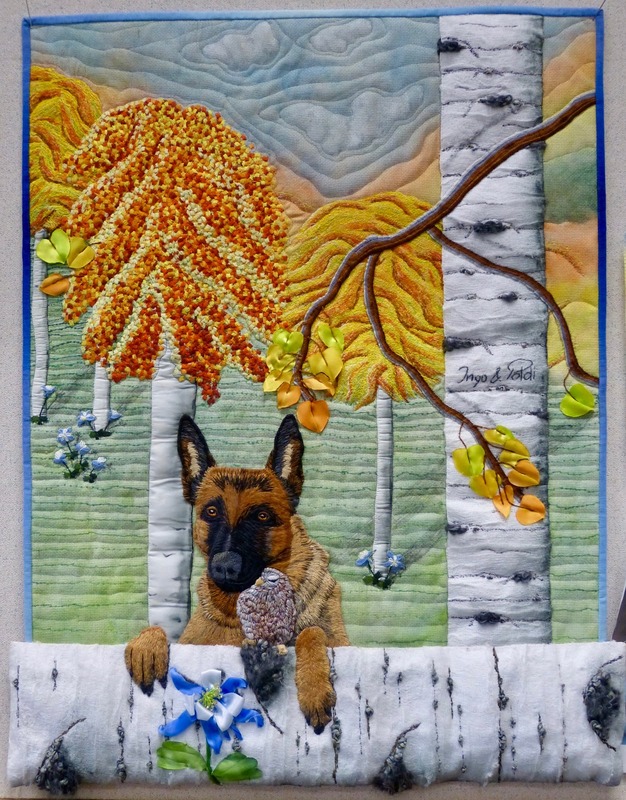 Kathy's most recent quilt, "The Best Friends," is based on a photograph by German wildlife photographer, Tanja Brandt, depicting the unusual friendship of a German shepherd, Ingo, and a little owl, Poldi. Kathy obtained permission to use the photograph and then worked her magic. 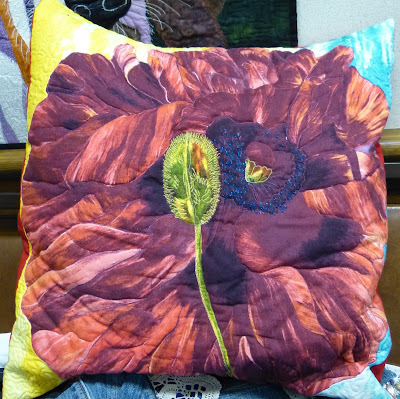 Kathy used a whole array of techniques in bringing this quilt to life, including a columbine flower she learned how to make from a Youtube video. 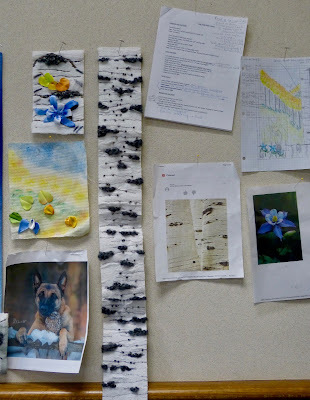 Kathy recommends exploring as many avenues as possible to learn new techniques and methods. 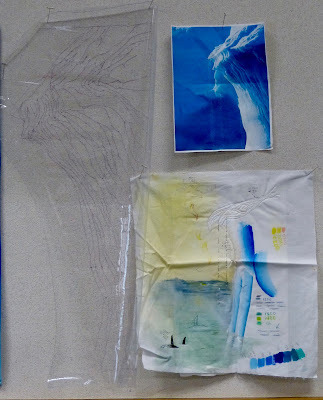 Among her favorites are Sharon Schamber's video on "Binding the Angel," part 1 and part 2, and The Art of Manipulating Fabric by Colette Wolf.